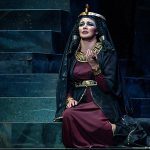 A profoundly personal love story told on a grand scale, Aida showcases Verdi's power to translate human emotions into magnificent music. The high-stakes love triangle between a captured princess, a conflicted military commander, and the King’s formidable daughter unfolds amid glorious spectacle and rousing choruses—including the famous Triumphal March. This visually imposing all-new production includes hieroglyphic projections by noted street artist RETNA and evocative choreography by in-demand visionary Jessica Lang. Aida looms large as a monumental masterpiece of the highest order.